With the plethora of smartphone instant photo sharing capabilities available to us these days and the advent of Instagram, it’s no wonder an average of 500 Million photos are shared online every single day! I know I certainly contribute my fair share of pictures to the interwebs, as do my amazing Outdoor Blogger friends, so we decided to get together to inspire you, with a little help from our awesome sponsors, to get outdoors with your family and hopefully, to remind ourselves just how thankful we are! Enter to win the #outdoorfamilies giveaway! Simply share a picture of you and your family doing an outdoor activity on Instagram and use the hashtags #outdoorfamilies and #thankfulforfamilies. Contest runs from November 19-26. You can share a photo daily (up to 7 total photos) and winners will be chosen at random and announced on Instagram by each participating blogger on their blogs. 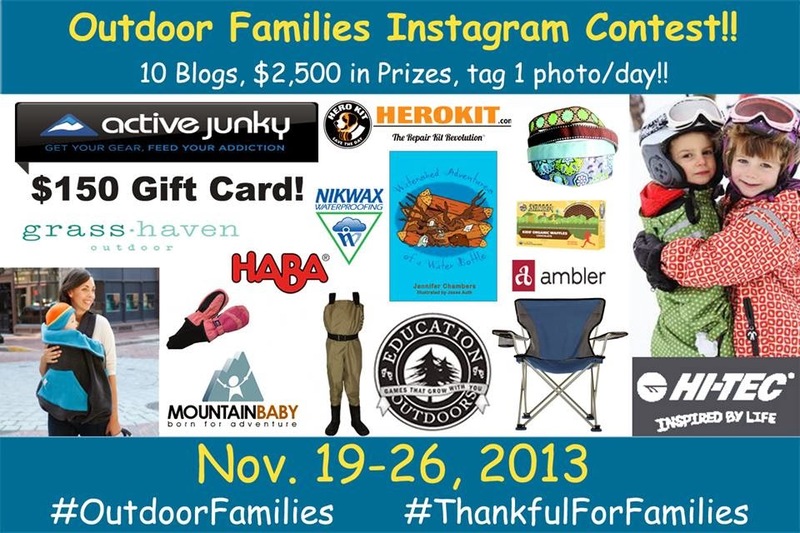 All photos must be tagged with BOTH #outdoorfamilies AND #thankfulforfamilies and submitted by 10 pm MST on November 26th. All winners will be chosen randomly from all submitted entries at the end of the week and announced on each of the blogs after November 26th. Comments will also be left on the winning photos to let you know you won. From Honey Stinger – 2 boxes (choc and van) of the new kid’s waffle – US ONLY! !